Increasingly, scientific breakthroughs will be powered by advanced computing capabilities that help researchers manipulate and explore massive datasets. The speed at which any given scientific discipline advances will depend on how well its researchers collaborate with one another, and with technologists, in areas of eScience such as databases, workflow management, visualization, and cloud computing technologies. 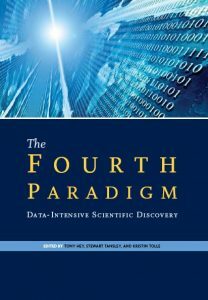 In The Fourth Paradigm: Data-Intensive Scientific Discovery, the collection of essays expands on the vision of pioneering computer scientist Jim Gray for a new, fourth paradigm of discovery based on data-intensive science and offers insights into how it can be fully realized. Microsoft Research is honored to provide initial website hosting for this book launch.